In antiquity the most important city of the Asiatic Aeolians and of the island of Lesbos. It had 2 harbors and strong fortresses. The city was noted for its high culture and for its zeal for art and science from the earliest times. The island, under the leadership of Mitylene, revolted in 428 B.C. from the Athenian confederacy. The city was besieged by the Athenians and finally taken. The inhabitants of Mitylene were treated with great severity; the walls were dismantled, and the city was deprived of its power on the sea. In the time of Alexander the Great, Mitylene suffered most through the Persians, and later by the occupation of the Macedonians, but afterward regained its power and prosperity, and still later was favored by the Roman emperors, being made a free city by Pompey. 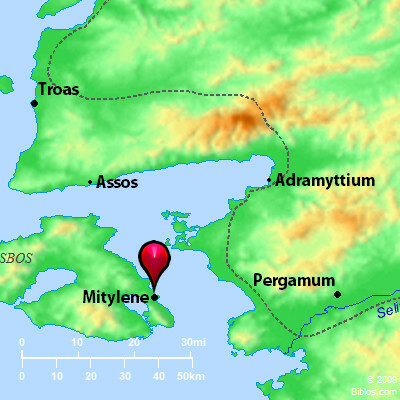 In the Middle Ages, the name Mitylene was applied to the whole island. The present capital, often called simply Castro, has a large castle built on the site of the ancient acropolis (in 1373). The city was conquered by the Turks in 1462. It contains 14 mosques, 7 churches, and has a population of about 15,000. On his third missionary journey, Paul traveled to the Hellespont from Philippi, thence through the Troad by land to Assos on the southern side-where extensive excavations were carried on in 1881 by an American archaeological expedition-thence by ship to Mitylene (Acts 20:14), where he spent the night. Leaving Lesbos, he sailed southward to a point opposite the island of Chios (Acts 20:15). There is no record that a Christian church had been established in Mitylene at this time. Tozer, Islands of the Aegean, 121, 134, 136; Ramsay, Paul the Traveler, 291;. MITYLE'NE, was the chief town of the island of ancient Lesbos and on its e. coast. Pop. now, 6,000, with ruins, its present name is Castro, 55 ms. n.w. of Smyrna.